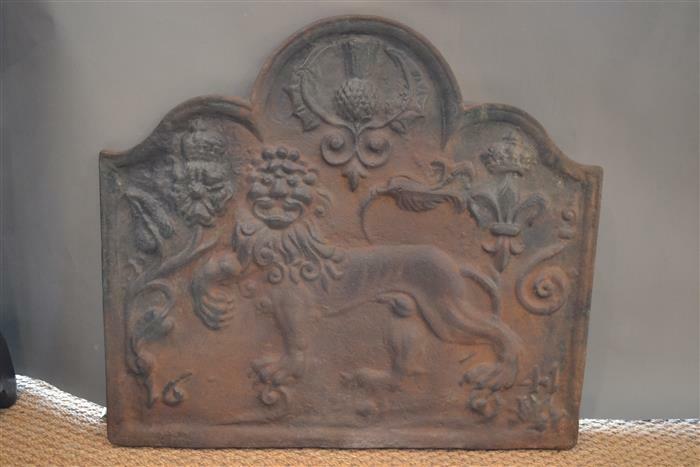 Suffolk House Antiques | A cast iron fire back dated 1641. A CAST IRON FIRE BACK DATED 1641. A cast iron fire back of ogee-arched design with an English rose, a French fleur-de-lis and a Scottish thistle and with the date 1641. The rose and fleur-de-lis represent Charles I and his French wife Henrietta Maria. The significance of the thistle and the date lie in The Treaty of London which was signed on the 10th August between Charles I and the Scots. It is 30 1/2 inches wide x 27 1/2 inches high. A similar example is shown in Seymour Lindsay's "Iron and Brass instruments of the English House". SOLD.